A new publication from two Cornell psychologists is an academic’s take on human bonding: “Bases of Adult Attachment: Linking Brain, Mind and Behavior” (Springer, 2015). The book is edited by Vivian Zayas, associate professor of psychology in the College of Arts and Sciences, and Cindy Hazan, professor of human development in the College of Human Ecology. Hazan and Zayas both have chapters in the book. Hazan says her work on the topic began before most of today’s undergraduates were born, publishing a 1987 journal article titled “Romantic Love Conceptualized as an Attachment Process.” Since then more than a dozen books and edited volumes by other academics have focused on the notion of adult romantic attachment. 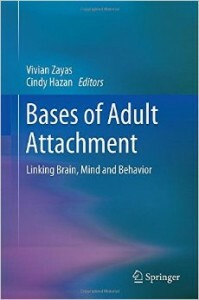 The new book, Zayas and Hazan explain, is unique in its emphasis on normative processes and the development of romantic attachment bonds. Co-authors are from McGill University, Canada; University of Virginia; Weill Cornell Medical College; University of Utah; University of Minnesota; University of Washington; Bilkent University, Turkey; University of Illinois at Urbana-Champaign; Deakin University, Australia; and University of Kansas. Posted in Features and tagged adults, romantic attachment on March 11, 2015 by Allison M. Hermann, Ph.D..